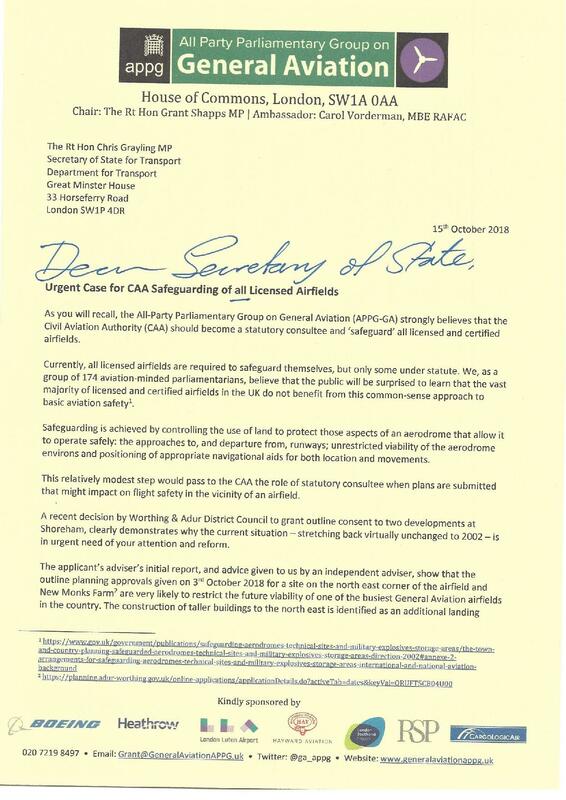 The All Party Parliamentary Group for General Aviation (APP-GA) has written to the Secretary of State for Transport urging him to reconsider the safeguarding obligations invested in the Civil Aviation Authority (CAA) in order to improve protection for the UK’s vital network of airfields. Currently, all airfields licenced by the CAA are required to safeguard their own operations from planning developments in their area. This is achieved through controlling the land surrounding aerodromes to protect vital safety infrastructure like navigational aids and approach and departure routes. However, only a small proportion of UK airfields are protected in this way by statute, meaning many are not properly consulted when developments are approved on their doorsteps. 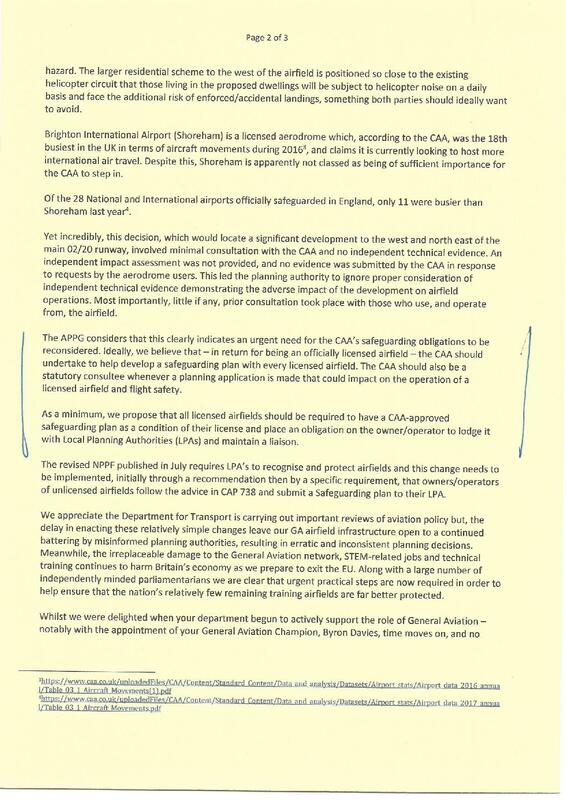 In their letter the APPG-GA calls on the Government to extend the safeguarding responsibility for airfields to the CAA. This relatively modest measure would pass the role of statutory consultee to the CAA when plans are submitted that might impact flight safety in the vicinity of an aerodrome. Even if this measure was only enacted for licenced aerodromes, some of the nation’s most important general aviation hubs would be better protected from hostile developments. One example of the problem is the recent approval given by Adur District Council to a major housing development to the west and north east of the main runway at Brighton International Airport (Shoreham). Shoreham is one of the busiest aerodromes in the country and is a popular spot for training aircraft on the south coast. Yet, incredibly, the decision to locate a significant development next to the airport involved minimal consultation with the CAA and no technical advice on the potential impact created by its proximity to the runways. In the APPG’s view, this case clearly illustrates the urgent need to reconsider the CAA’s safeguarding obligations. 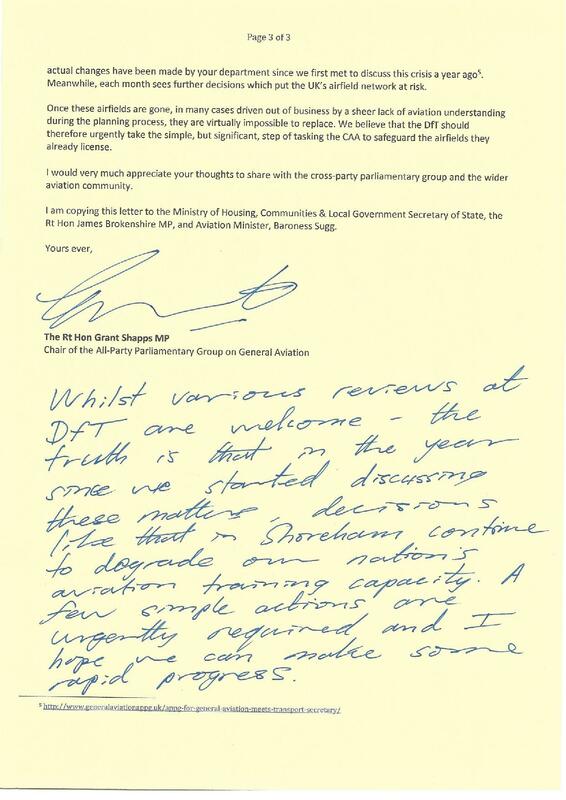 Please find attached a full text of the letter. For further information, please contact APPG-GA Head of Secretariat James Shipp at shipp@generalaviationappg.uk or on 0207 219 8497. The Letter can be found by clicking here.